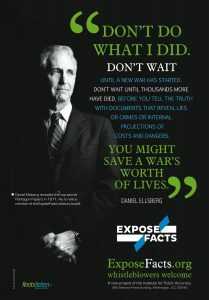 The statement by Ellsberg was read by Army veteran and retired diplomat Ann Wright at a news conference Friday morning outside the Department of Justice organized by ExposeFacts, a project of the Institute for Public Accuracy. Video of the news conference, which also featured remarks by retired CIA analyst Ray McGovern, is now available at Facebook Live. Higher quality video and audio will be available later today on Youtube and via @xposefacts.